Duration : 2 hour 10 mins. 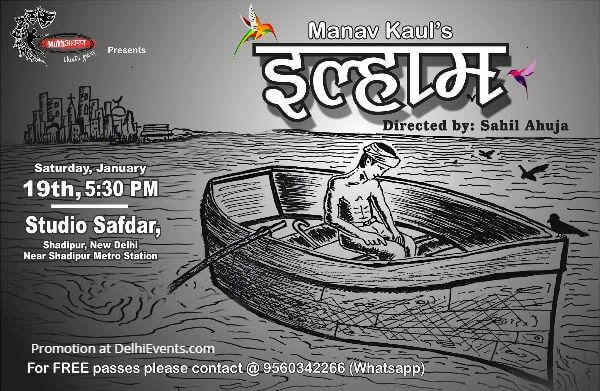 Event Description : THEATRE : Mukhavaran Theatre Group presents "Ilhaam" Hindi Play. The story is set in a middle-class family in Northern India. The protagonist, Bhagwan is a married middle-aged banker with two college-going children. Nonetheless, one day while sitting on a dilapidated bench in a park he stumbles upon ‘Enlightenment’ aka ILHAAM. Therein begins the battle between the world outside and his world inside. Ever since things start to fell apart as he loses his job, his whereabouts are unknown for weeks and when he is finally found, his family and friends cannot understand a word that he speaks. However, he is able to understand the sparrows around, a dumb-mute beggar that only he can listen to, a chacha (uncle) that only he can see! Bhagwan’s journey to the other side becomes as enthralling as it is bewildering as it gets coupled with these eerie things. Is that something that he really wants? OR would he be able to manage to return to his wife, his daughter, and his ordinary life?